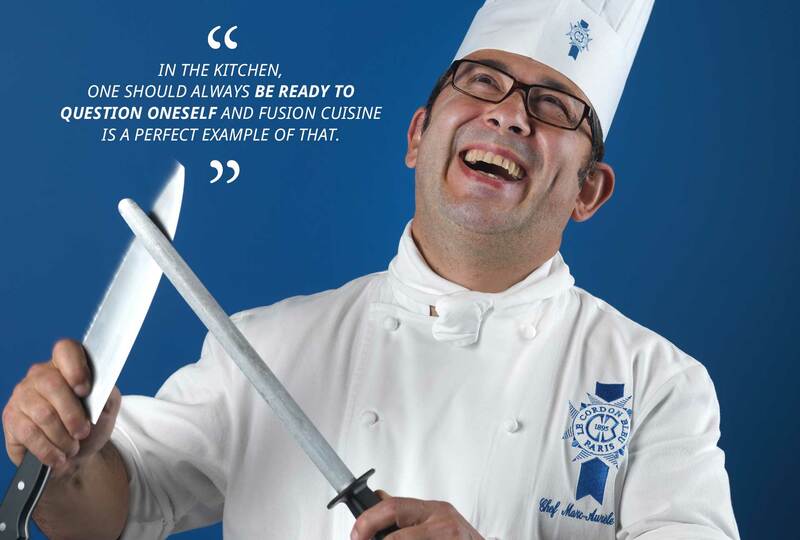 Chef Vaca joins Paris Chefs' team in 2012 after a career in renowed establishments and in Australia. How did your culinary career start and why did you want to become a Chef? I had a passion for cooking from an early-age and I was fortunate enough to have grown up in a family environment where food was of utmost importance. What is more, my grandmother was once a head chef in Lisbon; she was quite a Cordon Bleu herself! You travelled a lot throughout your career, London, Morocco, Australia, New Zealand…did it influence your cuisine? Travelling opened up a whole new culinary world to me where I discovered new styles of cooking, new products and new tastes. Australia in particular with its cosmopolitan cuisine had an impact on me. Australians are adventurous and open to their neighboring countries’ culinary delights and ways. Thus, Asian influences are ever present in Australian cuisine. In the kitchen, one should always be ready to question oneself and move ahead and fusion cuisine is a perfect example of that! For you, what are the key qualities needed to becoming a Chef? To be a good Chef, one needs to be passionate about cooking. They also have to be curious about everything, generous and committed. Dining is about sharing and conviviality. Throughout history, many decisions were made around the table. It is thus important when cooking to give ones best at all times. My advice to an aspiring chef would be to stick with it, to be hard working and determined. The trade is increasingly competitive and the road ahead can be arduous. However, down that road, there are discoveries to be made and great moments to be had. I would also suggest that they be multitasking; it is not enough just to know how to cook to be a Chef, it is also important to be able to guide a team, be a leader, share know-how and to be accessible all at the same time. As a final point, travel is also essential as it broadens the mind from a culinary standpoint and on a human level too. What do you think of the recent craze of cookery as entertainment (TV shows, contests…)? The popularity of these shows has sparked an interest in the culinary arts, which is positive. And, on a more personal level, what is your favorite dish? I don’t have any particular favorites whether it be an ingredient or a cooking style, what counts for me is that the dish has been prepared with care. I have a weakness for tiramisu and crème brulée! And in general, I prefer simple authentic desserts like those from my childhood. No, I don’t have any preference. I just simply love working with select produce. What could one expect to find in your refrigerator? You would find for the essentially fresh produce such as fruit and vegetable, meat, fish… that I am very careful with, as I hate to see food going to waste, it is important to respect food. Apart from French cuisine, what is your favorite style of cuisine? In general, I am open to all styles of cuisine!